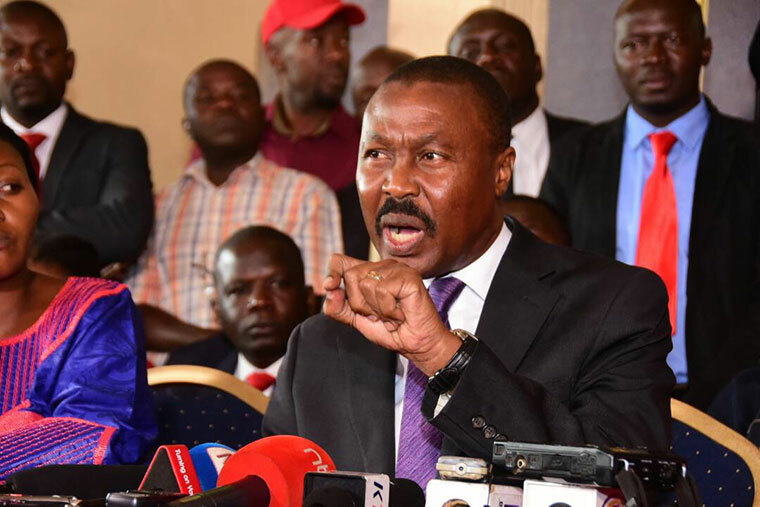 KAMPALA– Former FDC party president on Thursday held a press conference in Kampala, explaining why he had quit the largest opposition party in the country. The press conference was a follow-up of the Tuesday statement he issued on the matter. Below are key excerpts from the speech. Mugisha Muntu: If we were to remain in FDC and keep fighting, in 2021, irrespective of who would hold the flag, that flag wouldn’t take us anywhere. Mugisha Muntu: On the issue of being hungry for power: I have lost three times to Dr. Besigye and I went behind him, I went around the country campaigning for Dr. Besigye. Mugisha Muntu: We all need to work for a country that when our police fight, they fight for us all. The political space in the country is shrinking day by day and so is the patience of Ugandans. We shall keep our dialogue open and we shall ensure an open door policy between us and the FDC. Gen. Muntu: At this point, I don’t know how many have departed with me from FDC. Whatever number they are, we shall know internally but shall not make it a public thing to make it seem like we fighting with FDC. I did not leave FDC because I lost. I left because of internal fights. I have never feared what people think because it’s time that makes judgment. Gen. Muntu: Even if FDC was to enter a power sharing deal, I wouldn’t be part of government. I have no issue with Kizza Besigye and we shall meet because we are all actors in the political environment. I don’t mix things. We don’t become enemies after we compete. It is not about running for presidency now. It is about the level of infrastructure and capacities we put behind the person running to take power. Let us not start with the leaders, let us start with building the necessary capacities. Gen. Muntu: Hon. Kyagulanyi is intelligent and is working with intelligent professionals. They have the capability to judge who they want to work with. I have moved out of FDC so even if I didn’t achieve a single thing, nobody should bother about that. I told Patrick Amuriat that our meeting with them was out of respect and recognizing that FDC has achieved something strong as a political party in Uganda. I have participated fully in building internal democracy in FDC and if FDC can sustain that internally, it’s something that differentiates FDC as a party. Gen. Muntu: They would be shocked if we moved away last year. We wanted the process of separation to be as smooth as possible. We are in touch with Hon. Kyagulanyi, Norbert Mao, Hon. Baswalira. And we recognize the demand out there that opposition should work together. We are willing and ready to attend meetings and if we are invited even if it’s an FDC meeting. This is not about us. We need to reach out to each other and form a strong credible alternative as the opposition. Gen. Muntu: 2004 was the last time I met President Museveni personally and that was in Nakasero at the state lodge. I don’t care about what people say about me. Time is the friend of everyone here and those outside. If it is the will of God, there’s going to be a time when people will be shocked when they know who the moles are. It is possible to manage this position, it’s incumbent about those that have remained and those who left to manage this. I was also called a mole when I was in the bush. We do things differently, that’s why people misunderstand us. Gen. Muntu: When a party doesn’t have internal stability, it can’t go anywhere. It’s not the flag that will take us forward, it’s the organizational capabilities you put behind the flag. If I was a mole in FDC, I would stay behind to destabilize it. Gen. Muntu: DP slogan is “Truth and Justice”, FDC slogan is “One Uganda One People” meaning DP and FDC should work together. FDC has an opportunity to re-brand and Patrick Oboi Amuriat wasn’t going to succeed in re-branding FDC with us there. Our instability as FDC would be instability of the whole opposition. FDC now has an opportunity to do everything they wanted to do. Alice Alaso: The new formation values are, we believe in democracy, good governance, gender equity, transparency, ethics, discipline and we aspire for national cohesion and national unity. Gen. Muntu: We believe that no single party can rescue our party on the dangerous part we are trading on. The political space in the country is shrinking day by day and so is the patience of Ugandans. Gen. Muntu: Our commitment to a united opposition is more real, we shall keep our dialogue real and we shall ensure an open door policy between us and the FDC. This decision was reached after an interactive process from citizens across the country. Our departure is in good faith and we believe that this action is mutually beneficial to FDC and those of us leaving at the end of the day we work towards the same goal.